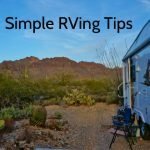 Over the years through the RVers grapevine I had heard a product called Simple Green mentioned over and over. 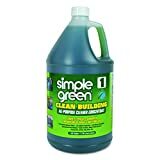 Almost any time a question was posed asking for cleaning advice several people would chime in recommending Simple Green. Finally, I picked up a bottle to try it for myself and I have to say “wow!” they were right. 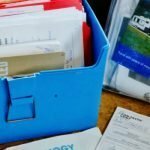 What took me so long to give it a go? 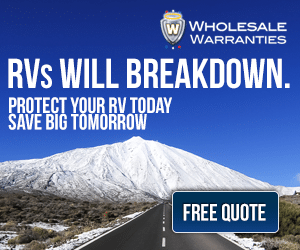 I initially bought it to clean some very stubborn black streaks that developed on my front fiberglass trailer cap and a few stains on the awning. 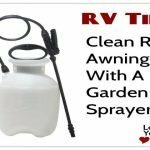 It worked so well I’ve tried it on all sorts of other things around the RV with also great results. 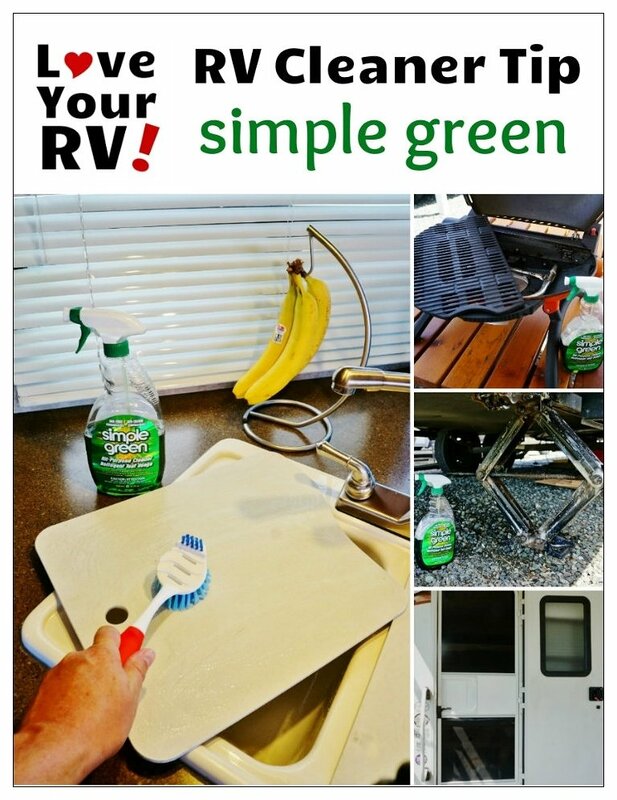 I’ve used the expensive bottles of “RV Black Streak Remover” in the past, but they pale in comparison to the job Simple Green does. The only difference is the Simple Green is more likely to be also stripping the wax coat off my fiberglass so I use it only when absolutely required. Then I wash and rewax the surface right away. Our rig came with white sink basins and matching covers. They seem to be constantly getting grimy with food stains, etc. Up until this point, I’ve been using bleach to keep them white, having to actually let the covers soak in a bleach and water mix for a few hours to get them white. I gave them a go with Simple Green full strength with about 10 minutes of soak time and they came out beautifully. The covers looked just like new! 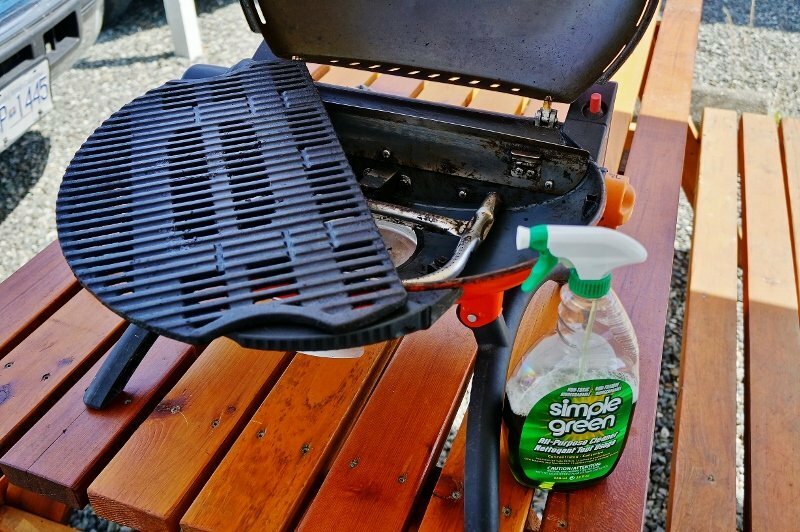 Simple Green is an excellent degreaser making my job of barbecue cleanup much easier. 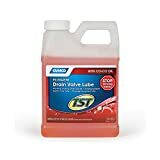 I spray it all over the greasy BBQ case and grill and let it soak in really well then wipe it off with paper towels. After that, I give the BBQ a good wash with soap and water to remove any Simple Green residue before using it for cooking. Simple Green claims to be “non-toxic” but I do like to be sure when it comes to food. 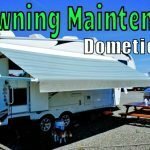 For care of my Dometic 9100 vinyl awning, I like to follow the manufacturer-recommended cleaning method. They say to use a mixture of bleach, dish soap, and water. But for really stubborn spot treatment where this solution isn’t enough Simple Green does an excellent job. 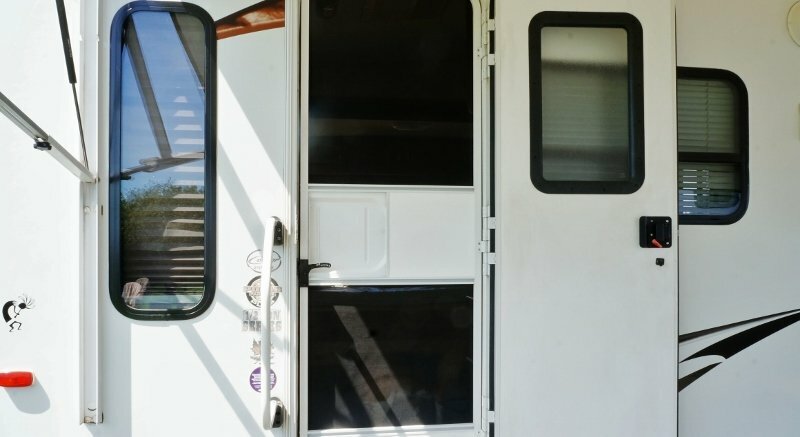 Our main entrance door and the surrounding frame is white plastics and metal and seems to really attract dirt and grease. 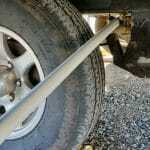 I’m likely the main culprit with my dirty hands from working around the trailer and truck. Simple Green is easily able to cut through the grease and grime making it all shiny and white again. 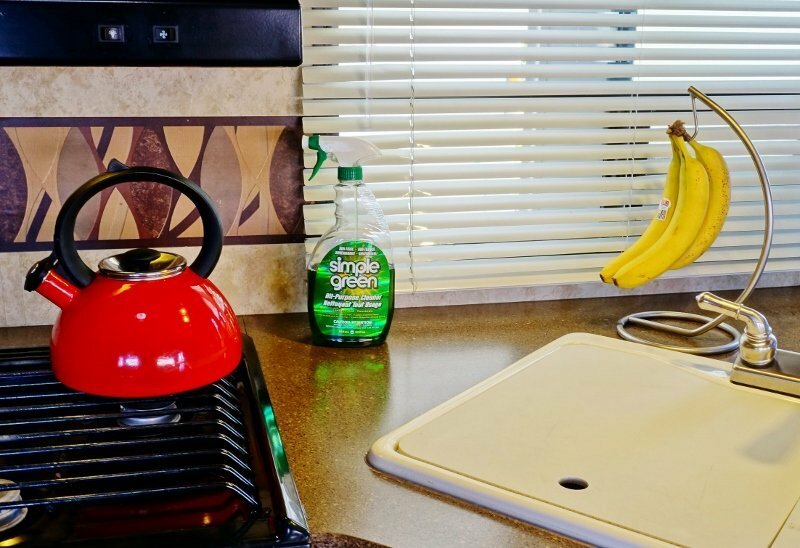 By diluting it with water, Simple Green can be used to clean our vinyl floors and RV walls. 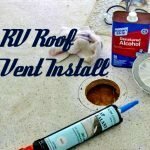 It’s also great at getting out grease spots in carpeting and clothes. 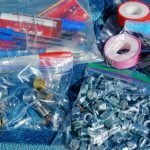 Best of all it is safer for our pet, being that it’s non-toxic. We have a set of white metal window blinds in the kitchen. They are located right near our gas stove and end up getting covered in grease splatter. To give them a thorough cleaning I unhook them and take them outside. Then I soak them in Simple Green, give them a light scrub with a soft brush and hose them off. They come out perfectly clean again with little effort. 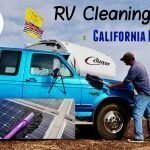 I use it to clean off old greases and oils from the rear stabilizer jacks and other metal parts under the RV before applying fresh lube. 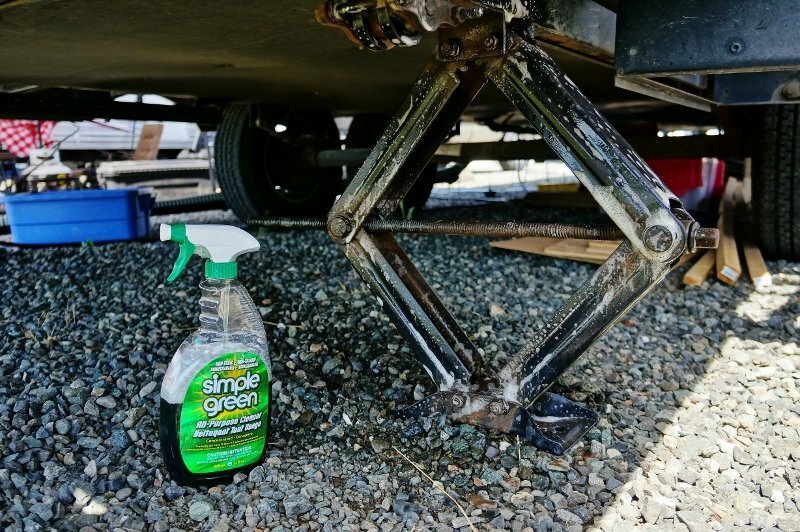 Simple Green applied full strength does a great job of removing all the old grease and road grime off my fifth wheel hitch prior to applying fresh lubrication.